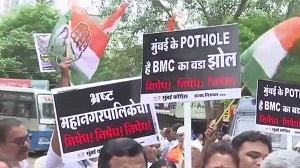 With heavy rains and waterlogging bringing Mumbai to a halt, Congress has begun a campaign to count potholes in the city. Lashing out at the state government, Congress President Sanjay Nirupam said: 'Mumbai is badly affected by flood. People from Shiv Sena and BJP are nowhere to be seen. So we started this campaign to count potholes and send pictures to Brihanmumbai Municipal Corp (BMC)." Chief Minister Devendra Fadnavis had on Tuesday claimed that the number of potholes on Mumbai's roads have reduced considerably over the past four years. He also announced that the Mumbai civic body would collaborate with the Indian Institute of Technology-Bombay (IIT-B) to further reduce potholes. He had informed the Assembly that the BMC had so far spent Rs9.3 crore to fill potholes, while Rs80.73 crore worth of tenders were issued for resurfacing roads and other repairs. Recently, a woman was crushed to death after she fell off the bike on a water-logged road. The incident took place in Kalyan in Mumbai when the victim, identified as Manisha Bhoir, was riding pillion on a bike in Kalyan's Shivaji Chowk. Bhoir was holding an umbrella when the bike hit a pothole on the flooded road. Both she and the rider fell to the ground. But before she could get up off the ground, she was crushed by a passing bus. The rider and the passersby rushed to her rescue but the woman died on the spot. She reportedly worked at a school in Kalyan and was going back home when the accident took place. The fatal accident was caught on CCTV camera. The mishap exposed the sad state of infrastructure in Mumbai, which the residents have to endure every year in the Monsoons.